The debate on how the United Kingdom (UK) can best meet its energy needs has intensified over recent months. There is broad agreement that energy should be affordable, greenhouse gas emissions need to be reduced, and energy supplies need to be reliable for businesses and consumers to facilitate the UK’s economic recovery. Despite these benefits, Britain’s 4 GW of existing interconnector capacity is relatively small; representing around 5%of total installed electricity generating capacity. This compares with the benchmark highlighted by the European Commission in January 2014 for all EU Member States to have a level of electricity interconnection equivalent to at least 10% of theirinstalled production capacity to realize the full benefits of the Internal Energy Market. In order to reach this benchmark Britain would need to double its existing interconnector capacity.Britain is therefore poised to complete the final design elements of the new regulatory regime, enabling developers to secure the considerable capital required to deliver these complex and technically challenging projects. Through continuing to work together, the above stakeholders are now well placed to build on the successful momentum developed to date, to secure the necessary regulatory and investment decisions for a 4-5 GW portfolio of new links in 2014/2015 and unlock the benefits including a GBP 1 billion wholesale electricity price reduction per year by 2020. As renewable electricity forms an increasing part of the energy mix, interconnection is becoming an important tool in managing the intermittent power flows associated with these sources. Based on the consumer, energy security, environmental and economic benefits which could be accessed, greater GB electricity interconnection is considered a ‘no regrets’ investment by a wide range of informed stakeholders within the UK and beyond. This consensus includes the UK Government, the regulator, consumer organizations, green groups, think tanks, academics and the main European Union institutions. An interconnector between UK and Iceland (sometimes referred to as the IceLink) could become an important part of the additional interconnection. UK already has four interconnectors to France, Holland, Ireland, and Northern Ireland. These links, with a total capacity of 4 GW, represent around 5% of the existing electricity generation capacity in the UK. However, this level remains low compared to the 10% benchmark proposed by the EU Commission and there is strong consensus that this gap should be filled. 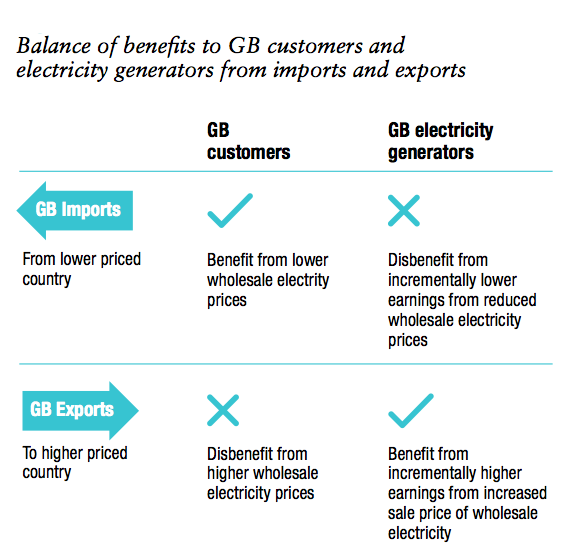 While GB remains a net importer of power, economic benefits are available through greater disposable income from lower domestic electricity prices, and enhanced competitiveness for businesses benefitting from reduced energy input costs. Were a portfolio of new projects to be commissioned, the economy would also benefit from new jobs created in activities such as planning, construction and maintenance. They could also catalyse new domestic manufacturing industries in areas such as sub-sea cabling. 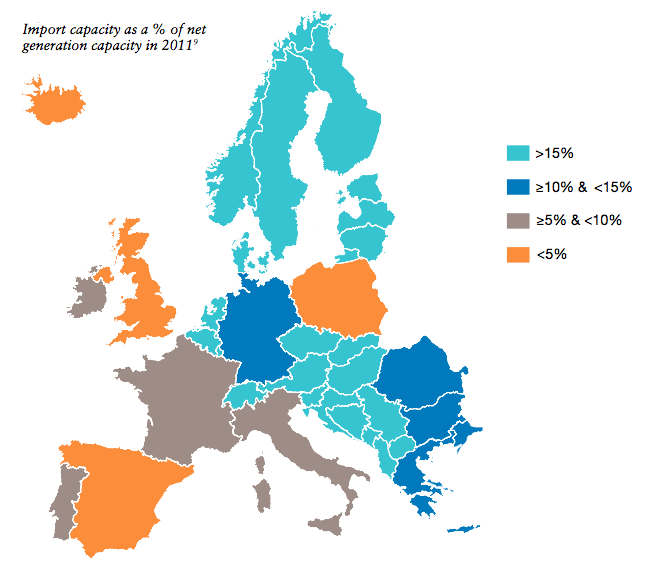 Electric interconnectors allow low carbon electricity to flow between European countries more easily and could enable carbon and renewables targets to be met more cost effectively. Significant volumes of low carbon electricity could, for instance, be imported into UK from hydropower in Norway, wind power in Ireland and Denmark, nuclear in France and hydropower / geothermal energy in Iceland. Copyright statement regarding the NG Paper: © National Grid Interconnector Holdings Limited 2014, all rights reserved.